We are market leader manufacturer on Grooved Feed Sleeve. 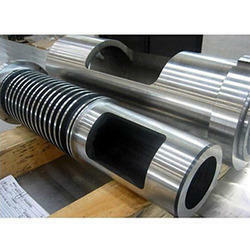 We are leading manufacturer of screw barrel for extrusion machineries. We are supplying screw in single as well as twin as per the client requirement. We are counted amongst reckoned names in the industry, committed towards manufacturing a wide gamut of Grooved Feed. With an aim to cement our reputation in this domain, we are occupied in manufacturing, exporting and supplying Grooves Sleeve. Pioneer in the industry, we are engaged in manufacturing and supplying an impeccable range of Grooved Feed Sleeve. - Used in various fitting purpose. Groove Feed Sleeve Housing is a part in which the groove feed sleeve is inserted. We provide different designs of Groove Feed Sleeve Housing and with double water cooling arrangement. These Groove Feed Sleeve Housings are known for the superb quality and unsurpassed performance. Rusat Eng Works is leading company in manufacturing & exporting Groove Sleeve from Ahmedabad, India , We sue High Quality Standard Materials. Our Single Screw Barrel widely use in extrusion plants & machinery, it available in various sizes & customer specification.